Art studios…specialty shops…beaches…Amish finds…dining discoveries…cozy inns. Find everything you want for an easygoing adventure that leaves the everyday world behind. We’ve chosen only the best stops! The seven loops of the trail sweep from Lake Michigan and the Indiana Dunes, to areas known for sparkling inland lakes, past the Golden Dome of Notre Dame, and onto roads where horse-drawn Amish buggies seem to outnumber cars. Northern Indiana has a rich and diverse culture of artisans, crafters and farmers, and the Art and Earth Trail perfectly showcases these nowhere-else-to-be-found treasures. This Lake Michigan community began life as a planned resort town. At the Beverly Shores History Museum and Art Gallery housed in the former station master’s residence of the Beverly Shores Depot, learn about a famed railroad’s part in the town’s history and view the varied works of local artists. You can easily spend a day or more in this bustling community. Start off with a delicious breakfast of fresh organic fare at Third Coast Spice Café before you peruse the works of regional Northwest Indiana artists at the Chesterton Art Center. More artworks are on display at the Westchester Township History Museum, where Victorian era gardens and history exhibits welcome visitors to the elegant 1885 Brown Mansion. If you have some shopping in mind, don’t miss two unique stops: Molly Bea’s INGREDIENTS, which features more than 1,000 food items displayed in bulk bins, and the Schoolhouse Shop, for gourmet foods, gifts, and clothing, plus lunch on the patio in summer. For more food and shopping, stop at Duneland Pizza & Dunes Photography, for delicious pizza and framed photographs of the Indiana Dunes area for sale. filled with artisan cheeses, breads and pastries, plus ethnic food, fresh produce, and more. At the end of any day, sample a variety of small-batch beers and ales at Hunter’s Brewing, which also serves award-winning chili. Then tuck for the night at DunesWalk Inn at the Furness Mansion, an 1881 mansion turned into a beautiful boutique hotel. This vibrant college community, home of Valparaiso University, is the perfect place to get your art fix and enjoy a host of special events. In fact, Valparaiso Events has more than 80 days of planned activities throughout the year. For art lovers, the Brauer Museum of Art on the Valparaiso University campus is a must-see for its nationally recognized collection of American works. Nature’s own art show is on display at Gabis Arboretum at Purdue Northwest, (formerly Taltree) where trails take you through formal gardens and along woodland pathways. Then enjoy a whole different kind of art at Air One Aerial Photography with amazing aerial and panoramic shots for sale. There’s so much to love about Valparaiso that you might want to plan an extended family gathering at Inspiration Wood Cottage Inn & Retreat, a cottage retreat just 10 minutes from the Indiana Dunes National Lakeshore. Whether you’re in town for the day, the weekend, to see art or head north to the lakeshore, make sure to stop at Valpo Velvet Shoppe, for everyone’s favorite ice cream, a treat local residents have cherished for over 60 years. Mother Nature must have had fun in mind when she blessed the community of LaPorte and its surrounding area with plenty of water and a fertile growing region. And it’s all yours to enjoy! Check into the Blue Heron Inn on the shores of Pine Lake for a relaxing getaway in this 34-room hotel, which also offers five floating boathouse suites and great dining next door at T-Bone’s Pier 11. Take advantage of the earth’s bounty in the area by stopping to pick your own blueberries each summer at Blueberries of Indiana in a quiet rural setting perfect for a picnic. In the fall, apples abound at Garwood Orchards & Farm Markets, which the Garwood family has operated for generations. Through the rest of the growing season, Garwood sells everything from strawberries in early summer to Christmas trees when the holidays roll around. 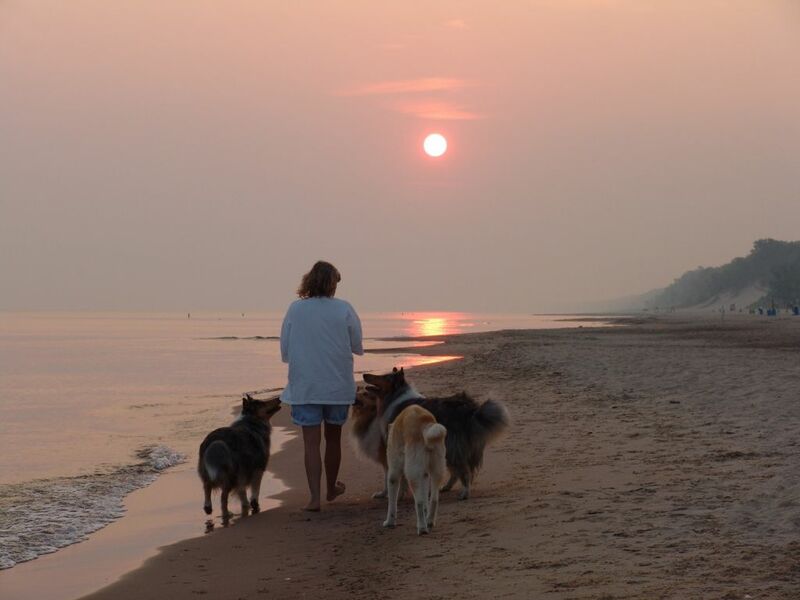 There’s so much to do in this Lake Michigan community, marked by a seemingly endless beach, glistening Great Lake waters that invite swims and strolls, and beautiful Washington Park right next to the shore. 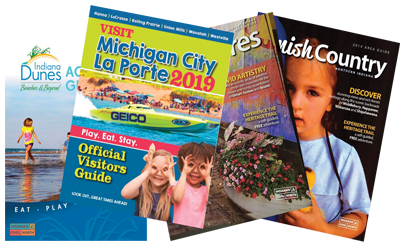 A good way to plan your visit is by starting at the Michigan City LaPorte Convention & Visitors Bureau website for all kinds of information on what’s going on around the county – places to stay overnight, indulge in a terrific dinner or visit a unique attraction. While you’re near the shore, you might want to stop by the Washington Park Zoo with more than 90 different animal and plant species. Art lovers can get their fill at the Lubeznik Center for the Arts just steps away from the lakefront, with five galleries and an outdoor art collection. The Southern Shore Art Association supports artists from Indiana, Michigan and Illinois with monthly exhibitions in its Uptown gallery where you can meet the current exhibiting artists on “First Fridays” each month. The Uptown area itself is exploding with trendy multi-cultural restaurants, art studios and galleries, museums, boutiques, consignment and vintage shops under the umbrella of the Uptown Arts District/Michigan City Mainstreet Association, which also sponsors special activities and festivals. The whole area is listed on the National Historic Registry. Dining is always at the top of visitors’ lists, and Michigan City delivers. You might enjoy the peaceful surroundings for dinner at the Duneland Beach Inn, tucked in the woods just a block from Lake Michigan. The inn also features eight guest rooms. Or sample a unique brew along with delicious food in the lively atmosphere of Shoreline Brewery & Restaurant. For some different libations, taste the award-winning vintages at Shady Creek Winery on nearly 20 acres along the Lake Michigan shore. Before you leave town, spend some time picking apples at Radke’s Orchard, family-owned since 1894. Bring along a picnic and enjoy at one of the tables scattered throughout the 40-acre orchard and woods. There always seems to be something special going on in this energetic city. 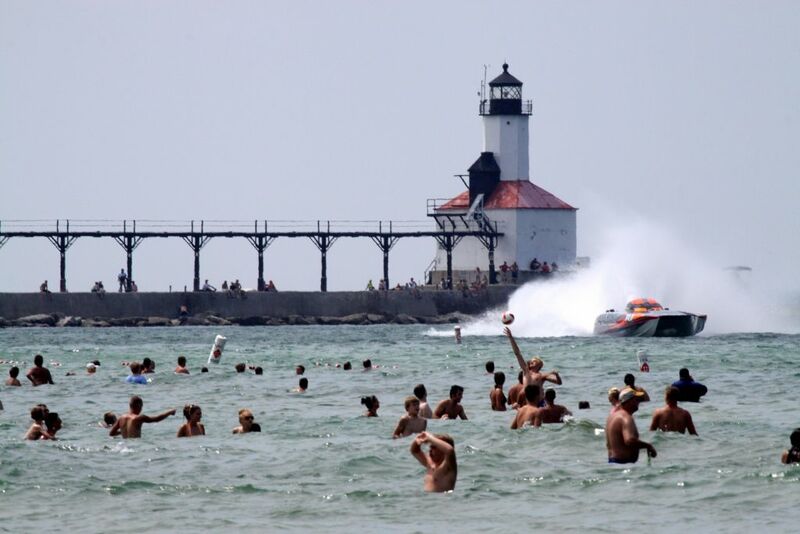 Some of the fastest and most colorful powerboats in the world roar across Lake Michigan at speeds nearing 200 miles per hour at the Great Lake Super Boat Grand Prix, drawing thousands of spectators to the shore each August. For more subdued entertainment, enjoy the performances at the Footlight Theatre, a wonderfully intimate community theater venue that seats 80. If you love history, don’t miss a tour of the elegant 1857 Barker Mansion, copied after an English manor house, where your guide will fill you in on the mansion’s past and some Michigan City history. At Friendship Botanic Gardens, a peaceful escape awaits walkers and bicyclists in forested woodlands, sprawling open spaces and cultivated gardens that spill over 100 acres. Larger-than-life sculptures created by world-renowned artists grace the grounds of Purdue University NorthWest, where you can take a self-guided tour of the largest outdoor sculpture park in the state, set amid acres on this pleasant shady campus. This community, South Bend’s next-door neighbor, takes advantage of its peaceful locale along the St. Joseph River. The city’s Riverwalk, a circular system of pedestrian/bicycle trails, spans both sides of the river, connected by pedestrian bridges. Mishawaka is also home to one of the largest u-pick blueberry farms in the Midwest – Blueberry Ranch – Organic. Pick your own, buy already packaged berries, and buy a blueberry bush to plant at home. Small-town friendliness just comes naturally in New Carlisle, home of Bendix Woods County Park, located just south of town. In February, the park becomes a lively place during the Sugar Camp Days Festival, which honors both the region’s maple syrup history and Native Americans who tapped the trees so long ago. 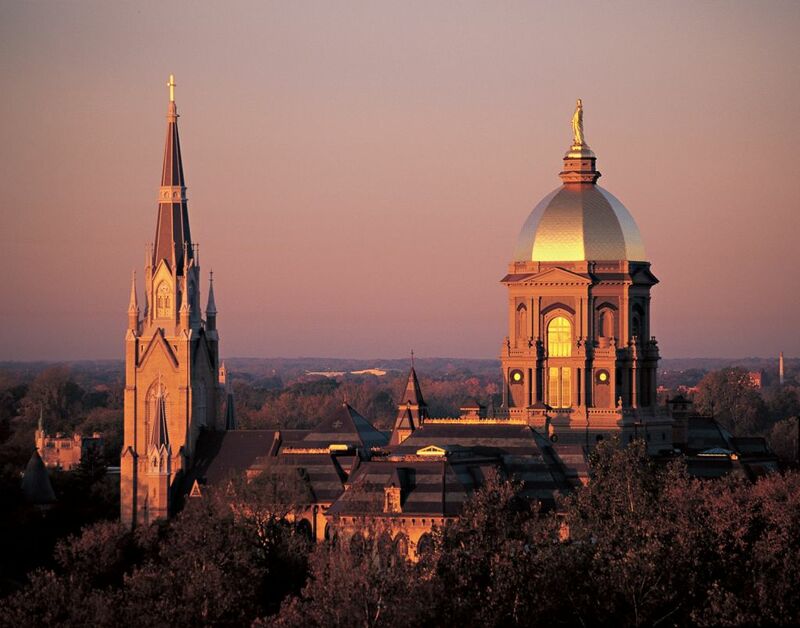 This lovely community is best known as the home of the University of Notre Dame and the legendary Fighting Irish. But history has left its mark here in many other ways too. At The History Museum, learn how the J.D. Oliver family made plows that greatly influenced agriculture in Indiana and throughout the world. Tour their Victorian mansion, a worker’s cottage and visit a children’s museum all at this site. You can live a little bit like the Oliver family did when you check into The Oliver Inn, where visitors stay in antique-filled guest rooms and enjoy a candlelight breakfast in the opulent dining room. Another South Bend family, the Studebakers came to town in a Conestoga wagon, but were best known for the beautiful cars they created. More than 100 of the pristinely restored vehicles are on display at the stunning Studebaker National Museum. 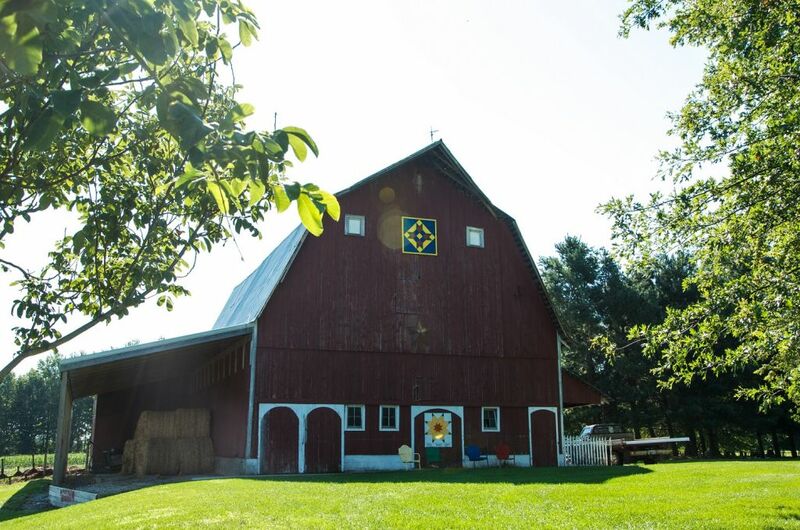 For a historical lesson in a beautiful natural setting, visit St. Patrick’s County Park where vintage farm buildings remain from the days when the hard-working Sisters of the Holy Cross grew crops and raised livestock for the Saint Mary’s College. Modern-day pleasures abound here too, such as hiking and fishing, and canoeing the St. Joseph River. The arts play an important role in South Bend, where you can enjoy extraordinary performances and view great works. Pop concerts, symphony, comedians, Broadway touring shows, dance and family entertainment all grace the stage at the Morris Performing Arts Center, the largest historic theater in the Northern Indiana region. Dinner and show ticket packages are available for most shows. At the South Bend Museum of Art, discover the creations of historical Indiana artists and experience compelling contemporary works by renowned American artists in the permanent collection. Every year in August, downtown South Bend comes alive at Art Beat, where you’re in for a day of every kind of artistic endeavor imaginable. The event features over 300 visual, performing and culinary arts. Visitors love the fine handmade quilts produced in Northern Indiana, but who would expect to find giant replicas gracing barns? Follow the Marshall County Barn Quilt Trail throughout the county to see colorful quilt patterns up to eight feet tall that grace area barns, public buildings and residences. You’ll pass through friendly communities along the way, including the town of Culver along beautiful Lake Maxinkukee. This peaceful little community is home to Ancilla College and the beautiful Ancilla Domini Chapel. MoonTree Studios, operated by the Poor Handmaids of Jesus Christ, an order of nuns who make their home here, is part of the sprawling complex that includes the college. The studios offer classes that may help you restore your spirit and creativity and also features exhibits by regional artists, some who have their works for sale. This classic Midwestern community is probably known best for the annual Marshall County Blueberry Festival, held each Labor Day Weekend in a four-day extravaganza. You’ll taste blueberries in the most delicious concoctions plus enjoy everything from a parade to a carnival to fireworks. Gardeners and those who just enjoy the bounty of the earth will love the Plymouth Farmers’ Market, where you can put a fabulous dinner together with locally raised produce and meats, buy cut flowers, browse locally made crafts and pick out plants for your garden all in one stop. There’s even more for gardeners to love at The Briar Patch, where they’ll show you how to create a perfect perennial garden and sell you everything you need to go in it. Enjoy the gardens there and visit The Old Homeplace for farmhouse finds from the old days. You won’t leave town hungry if you make sure to stop at Opie’s Deli, located downtown in in a quaint restored building. Enjoy deli sandwiches, Chicago-style hot dogs, fresh soups, and ice cream and gelato. Vacationers love their lake time in this community, and a trip aboard The Dixie Boat is a must-do for those staying at one of the local resorts or just in town for the day. You’ll get a little history, lots of old-time music and loads of fun on a 75-minute cruise around Webster Lake aboard Indiana’s oldest sternwheeler. A street filled with antiques stores draws collectors to charming little Pierceton. Plan plenty of time to peruse the eclectic finds at Blue Pearl Art Gallery & Antiques, where you can get your art, antiques and vintage jewelry all at one stop. This unique shop specializes in the works of Hoosier artists, Native American art, pop art and more. Get ready for some artsy finds in this community, which bursts with activity downtown every week during Warsaw First Fridays. A wide variety of entertainers, vendors and artists are on hand during themed celebrations. Downtown merchants and restaurants offer samples and specials. A trip to Warsaw wouldn’t be complete without a stop at Warsaw Cut Glass Company Inc., where gleaming hand-cut crystal, including goblets, pitchers and plates, has been produced since 1911. Art in another form can be found on stage at Wagon Wheel Center for the Arts, an award-winning theater that’s also one of Indiana’s oldest. In operation since 1955, this intimate theatre-in-the-round is nationally renowned for its Broadway quality theatrical productions. When you’re in the mood for a snack or a meal, log into Dine Downtown, where you’ll find everything from great breakfast spots to pizza places and fine dining establishments, not just downtown, but all over the city. 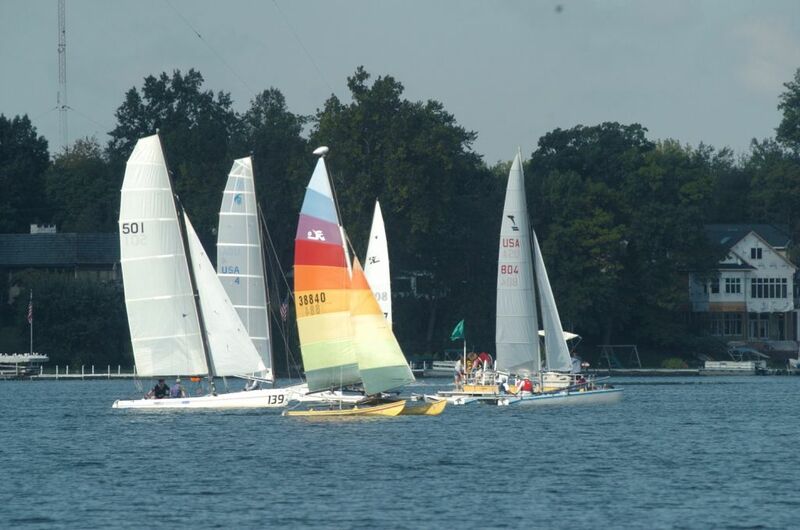 The picturesque community of Winona Lake stretches along the waters of its namesake – Winona Lake. Visitors often spend the day visiting the town’s unique shops, housed in refurbished workers’ homes of long ago. Start out your day at Light Rail Cafe & Roaster, where the beans for your java, specialty latte or cappuccino are roasted right on the grounds. The menu also includes breakfast, made with locally produced products whenever possible. After a morning or afternoon of shopping, stop into the Cerulean Restaurant, which specializes in delicious Mediterranean and Asian cuisine, including pasta and sushi, and also serves fine wines. This tiny town has a big history. 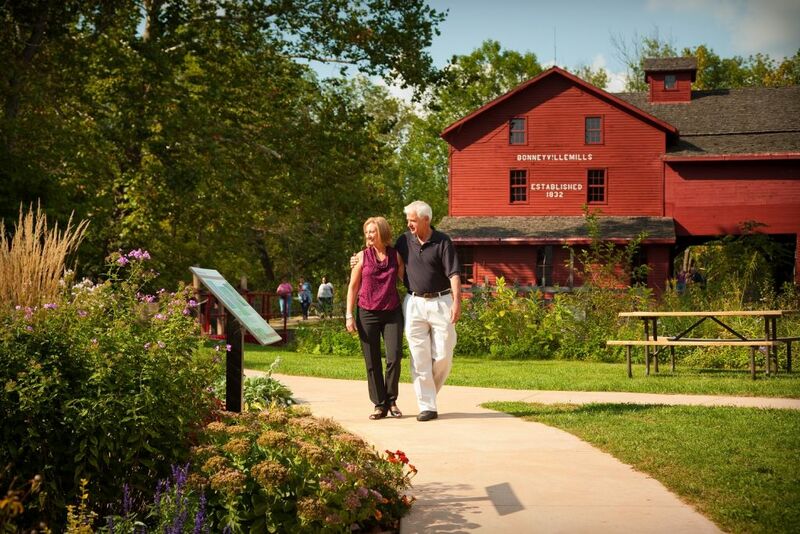 It’s the home of Bonneyville Mill, a water-powered mill that dates back more than 150 years. Today visitors experience the rustic charm and learn all about Indiana’s oldest continually operating grist mill. A stroll along this bustling city’s scenic RiverWalk is a must for any visitor. Take a break along the way at b on the River, a bakery, cafe, and boutique where you can shop for pottery and paintings and indulge in a fancy coffee or a delicious meal. Art lovers will find plenty to admire at Bradley Vite Fine Arts, an elegant gallery specializing in 19th and 20th century paintings, watercolors and historic prints.. Peruse original prints of John James Audubon and the works of Brown County artists. A couple of other stops in Elkhart provide a perfect fit for gardeners, history fans, and shoppers alike. The Ruthmere mansion at Ruthmere Museums Campus takes visitors back to 1910 Elkhart when this magnificent dream home was built. It includes beautifully tended gardens and lushly appointed rooms filled with world-class fine art and decorative arts. Bring the family to Linton’s Enchanted Garden and step into a magical world that is right out of a storybook at this award-winning home and garden center. Acres of colorful and inspirational displays, women’s jewelry and fashions, a petting zoo and even train rides create an afternoon of pure enjoyment. Pottery, pretzels, produce and a monthly party keep things lively in the community of Goshen, where you can shop for unique finds in restored buildings. In the Old Bag Factory, at Goertzen Pottery, shake the hands that throw the pots in this working studio, with more than 3,000 handmade creations for sale. Not far away, tempting aromas waft through the unique little shop known as Jo Jo’s Prezels, where they create soft pretzels in eight delicious flavors and also serve meals. Speaking of downtown, there’s a big party going on every month at Goshen First Fridays and you’re invited for live entertainment, food and fun with a different theme for each celebration. Peaceful roads that wind past proud Amish homesteads lead from Goshen into the countryside. With so much going on in the community, you might want to stay for the night at Rose Lane Farm Bed & Breakfast just outside of town. Guests enjoy misty mornings, quiet evenings and gourmet breakfasts in a country setting, overlooking Mennonite and Amish farms. Also in the countryside, you’ll find Kercher’s Sunrise Orchards & Farm Market, where the Kercher family has farmed for 93 years. There’s a good chance you’ll meet one of them when you stop to shop for locally grown and locally produced products. This small community is alive with Amish culture and great shopping to boot. Housed in an 1897 building, The Cinnamon Stick is rich in Middlebury history with original brick walls, but carries an inventory of shoes, gifts and accessories that is totally today. If you’re looking for a locally made Amish quilt or wall hanging, you can choose from more than 100 that grace The Quilt Shop at Essenhaus. You’ll come away with a deeper understanding of the Amish culture when you visit Amish Acres, a historical complex that includes an Olde Order Amish Farmstead wagon rides, performances at the historic Round Barn Theatre, bountiful Amish meals in the restaurant, shops and a comfortable inn. At The Nappanee Center, learn more of the town’s story and a see a display of “Hoosier” cabinets made in Nappanee. Stop outside at the center’s quilt garden (June-September) to see spectacular blooms planted in quilt designs. The visitors lounge is loaded with information on lodgings, dining and attractions in Nappanee and the area. Everyone who comes to this Amish region, wants to take something home, and shopping is a treat throughout Nappanee. A growing array of shops have found their home in this historic 1887 Coppes Commons, a great place to meet, shop and eat all in one stop! At the Coppes Commons – Nappanee Bakery and Treat Shop, they make their taste-tempting cinnamon rolls, breads, pies and cookies the old fashioned way without use of modern machinery. Amish crafters are well-known for their fine furniture. and at the HomeStyle Furniture Shoppe, Glen Schmucker takes great pride in featuring furniture created by local Amish crafters whose family businesses are in shops on their homesteads. This friendly community makes a great stop on your journey through the area, especially if you are seeking Amish treasures. Whether you’re looking for a custom-made table, cabinets or even wooden toys, you’ll find a finely-crafted piece of authentic Amish work at Schmidt Furniture, Cabinetry & Gifts, with a reputation for quality that stretches from Northern Indiana through the Chicago area. Quilts are an integral part of life in Northern Indiana and LaGrange County shows them off in a big way on the LaGrange County Barn Quilt Trail. Quilt designs are painted on 4-foot by 4-foot or 8-foot by 8-foot boards and displayed on barns throughout this scenic region. The Shipshewana & LaGrange County Visitor Center in town provides a map to follow. This may be a small community, but its population really multiples each Saturday for the Howe Community Association Farmers’ Market. Visitors love the chance to interact with the friendly Amish people who bring their fresh-from-the-garden produce, scrumptious baked goods, and amazing woodcrafts to sell from May through October. LaGrange County is known as the No. 1 organic growing area in Indiana, and these growers offer the freshest organic goods around at the twice-weekly LaGrange Farmers’ Market. From stands right next to the courthouse, they sell fruits, vegetables, honey, eggs, chickens, home-canned goods and crafts every Tuesday and Saturday May through October. You’ll come away from this peaceful and pretty town “smelling like a rose” after you visit Annie Oakley Perfumery, a perfume studio where you’ll learn how fragrances are created, blended and bottled. Take home natural and organic perfumes, bath and body products and fragrances for men and women. 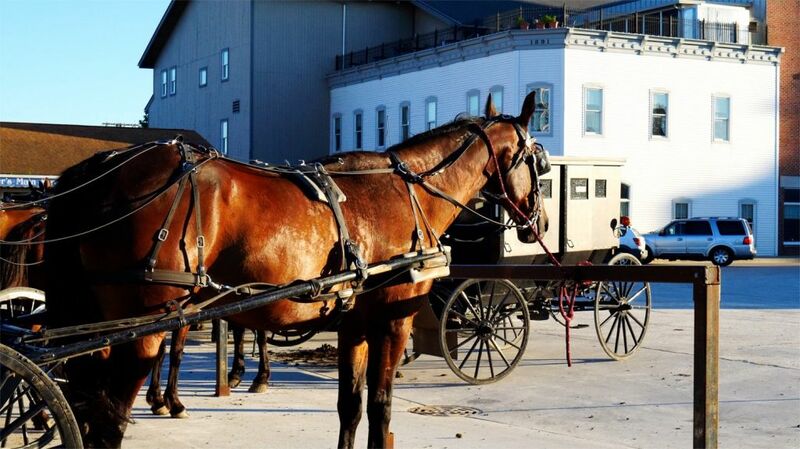 The horse-drawn buggies that clip-clop along Shipshewana streets and throughout this intriguing area make visitors curious about the Amish-Mennonite heritage that is still so strong today. At Menno-Hof, travel through five centuries of history from the group’s Swiss origins through their arrival in America to their lives in modern times. The Amish are renowned for their scrumptious and bountiful food. A great place to eat and take home some wonderful baked goods, jams and jellies is Bread Box Bakery & Café / Scherger’s Kettle. At Jo Jo’s Pretzels, Amish bakers will show how these delicacies are made from scratch. Try your pretzel dipped in one of Jo Jo’s famous mustards and dine on soup, sandwiches and ice cream. Another Amish favorite that visitors love to take home is honey. The bees do the initial work at “B” Honey but Perry Bontrager Jr. and his family, who own this operation, help them out with the final product. Choose from all kinds of flavors and pick out a beeswax candle too. There’s a different kind of shopping in store at Lotions & Potions, where when you chose your very own fragrance or a designer scent from more than 500 available. They go into lotions, shower gels, cologne and much more. At B & L Woodcrafts, peruse the hand-crafted lawn and patio furniture then shop in a barn full of antiques, crafts, bird feeders and more. End your day with an overnight at Morton Street Bed & Breakfast, an elegant white-sided 1880s Victorian home. After a hot breakfast in the morning, you can set off for another day of shopping and exploring. If you’ve never seen a bison up close, Wolcottville’s the place to go. Take a guided wagon ride at Cook’s Bison Ranch outside of town and you’ll learn all about this historic animal. There’s plenty of other fun in store at the ranch too. There’s a lot more to see and do in Indiana’s Cool North, but these trails should give you a great starting point.